When it comes to your dog's daily caloric requirements, there is a basic formula for determining ideal amounts. While this formula provides a starting point, a few other considerations need to be made before determining exactly how many calories your dog should be eating. Talk with a veterinarian or canine nutritionist to ensure you are meeting all of your dog's nutritional needs before making any changes to his current diet.Have a question? In order to determine your dog's calorie needs, you must first know your dog's exact body weight. Once you know his weight in pounds, divide this number by 2.2 to determine how much he weighs in kilograms. Next, take this number and multiple it by 30. Add 70 to that number and this is the amount of calories designed for the average spayed or neutered dog. Always remember that total calories include treats. This basic formula is designed for average, spayed or neutered dogs that receive light exercise on a daily basis. Unaltered dogs require slightly more calories, as do highly active dogs. Obese dogs will need fewer calories in order to reach an ideal and healthy weight. Puppies require additional calories for growth. Certain medical conditions, such as hypothyroid disease, also affect caloric needs and require veterinary guidance. 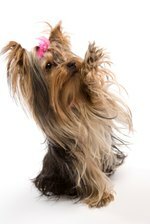 What Treats Are Good for a Puppy Yorkie?